Now I know what you're thinking. 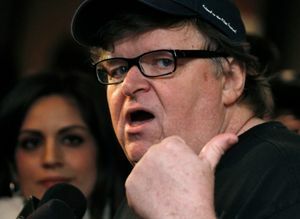 Who knew that Michael Moore was a song and dance man? Just kidding of course. It was recently announced that the award winning documentary filmmaker and author will be making his Broadway debut in the Terms Of My Surrender. The show which is being directed by Tony Award winner Michael Mayer (Spring Awakening, Hedwig And The Angry Inch) will begin previews at the Belasco Theatre on July 28, with opening night scheduled for August 10. So what exactly is the show about? Well according to the man himself, the show will pose the question, “Can a Broadway show take down a sitting President?” That sounds about right. Tickets for the show are now on sale. Oh and did I mention that we will be selling them? Well we are. Get your tickets to see Michael Moore in Terms Of My Surrender on Broadway at the Belasco Theatre. Until next time theatre fans.